Apple's own Claris software subsidiary delivered a hit and miss strategy that oscillated between promoting its Mac apps and then allowing them to stagnate. In 1990 Claris launched ClarisWorks, which competed against Microsoft's Works program as an integrated office application with multiple modules. After becoming popular on the Mac and outselling Works, Claris began offering a Windows version. Claris subsequently developed and acquired a variety of Mac software titles, including Resolve, based on the Informix WingZ spreadsheet; the FileMaker desktop database; the popular Emailer mail client; and the Organizer calendar. While its software was well regarded, the company ran into increasing difficulties that mirrored those of Apple: erratic management problems and a lack of clear direction. This resulted in a loss of engineering talent while an existing portfolio of applications fell behind. Claris' fate was sealed when Apple decreed that it would implement its popular ClarisWorks product using OpenDoc to prove it could be done. By 1996, Claris' portfolio of apps was in the same rough shape as the Mac OS, as described in Claris and the Origins of Apple iWork. After Apple acquired NeXT, it announced a new OS strategy called Rhapsody, which essentially rebranded NeXTSTEP with the Mac appearance. Third party developers, burned by a series of Apple's engineering dead ends including OpenDoc, QuickDraw GX, and Copland, refused to support Apple's new strategy, sending it back to the drawing board. Apple was back to 1981, with a new platform coming out and no developers to write for it. Once again, it had garnered a sketchy reputation from recent software development failures on the level of the Apple III and Lisa, and its existing Mac hardware business was now looking as long in the tooth as the Apple II had fifteen years prior. Also like before, Jobs made a deal with Microsoft that ensured new software would be released for it. Jobs' deal with Microsoft resulted in a five year commitment to deliver Office on the Mac in tandem with Windows releases. It also ended the remains of the disputes that had dragged along since the late 80s. In the Microsoft monopoly trial, Apple Software Engineering VP Avie Tevanian testified that Apple had additionally "put Microsoft on notice in 1996 that its Windows operating systems and Internet Explorer infringed Apple's patents." Also related in the deal was Apple's ongoing lawsuit over Microsoft's infringement of QuickTime in the Canyon case, as described in Mac Office, $150 Million, and the Story Nobody Covered. Apple and Microsoft would now work together, with Microsoft delivering Mac Office apps and a web browser that Apple lacked the resources to develop on its own, in exchange for Apple ending its ongoing litigation against Microsoft and receiving a $150 million vote-of-confidence stock deal. While some Apple faithful criticized the deal, it kept the classic Mac platform alive until Apple could replace it with a retrofitted version of NeXT's technology. Earlier in 1997, Microsoft had announced the formation of the Mac Business Unit as an independent group within Microsoft devoted to developing Mac software. The MacBU had 145 employees, which represented the second largest Mac development group outside of Apple. 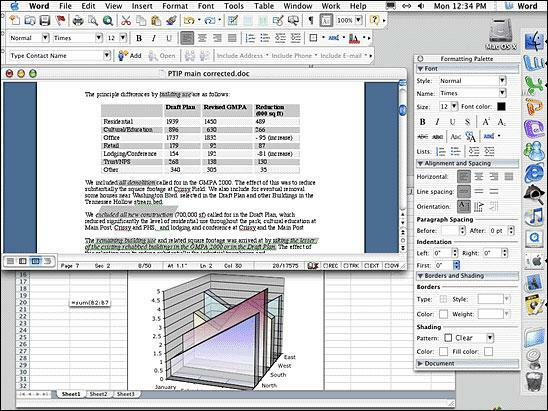 The following year, the MacBU released Office for Mac 98 (below), which delivered much of the look and feel of Microsoft's Office 97 for Windows from a year and a half prior. The release was plagued with bugs, but was received as a welcome addition given the four years of no new versions of Office for Mac. A UGeek Software Review underscored the warm recepton: "Microsoft Office 98 for Power Macintosh has exceeded all expectations," it said. In response to the Word 6 fiasco, the new release allowed users to choose between using the old Word 5 menu layouts or new ones that matched Microsoft's Windows version. 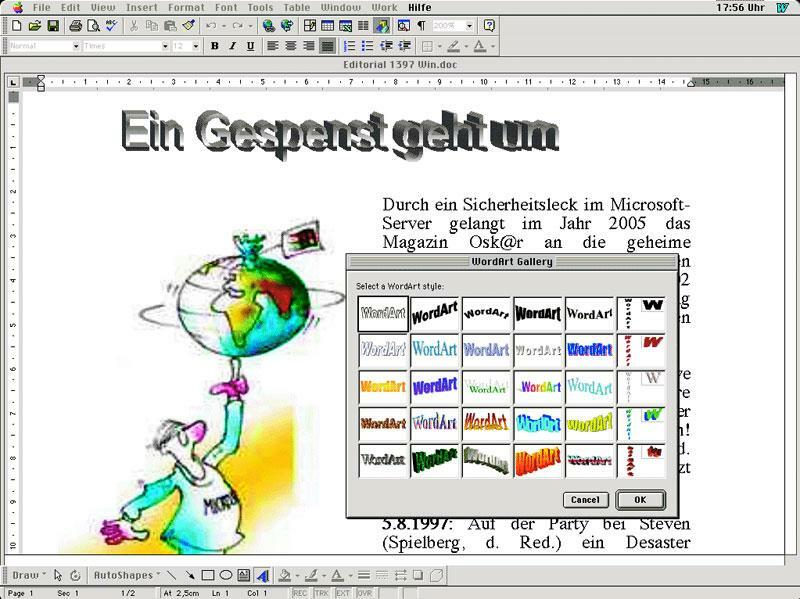 It also introduced other new features from Windows versions of Office, including the background spell and grammar checking highlighted by underlined squiggles. It was also PowerPC only, dropping support for older 68K Macs. Meanwhile, Apple absorbed Claris in 1998 and began selling ClarisWorks for the Mac under the name AppleWorks. In 2000, Apple released another revision of ClarisWorks as a Carbonized application, allowing it to run on both Mac OS 9 and the coming Mac OS X. Even at the time, however, it was clear Apple didn't have big plans for AppleWorks, and hoped to instead replace it entirely. Microsoft delivered its next version of Office for Windows in January 1999 as Office 2000. It followed up nearly two years later with Office for Mac 2001 in October 2000. 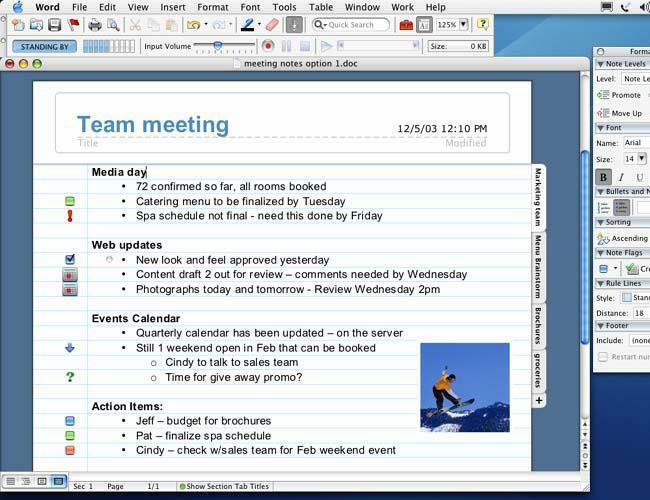 Users of Mac OS X were disappointed to find that Office 2001 wouldn't run natively on the upcoming operating system. Instead, it required the Classic environment. The list price was $500, with a $430 street price and $300 upgrade. 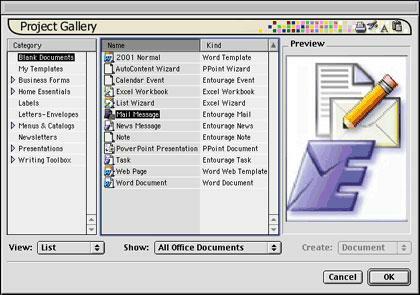 Despite two years of work, Office 2001 offered little over the 98 version apart from tweaks such as the Project Gallery (below) and an extended open file dialog that opened at launch. ATPM's Review: Microsoft Office 2001 noted that "Microsoft Office 2001 for Mac fulfills Microsofts legal obligation to maintain its application suite on the Macintosh platform," but complained that the Mac version didn't match features in the Windows version from nearly two years prior. The review called it a "mediocre upgrade to Office 98" and said users had little reason to upgrade. "Most of the new features are awkward, poorly documented, bug-ridden, or all three." A year later, Microsoft delivered Office v.X (Office 10) in November 2001, just six months after delivering Office XP for Windows. Microsoft delivered the new suite using Carbon, which allowed it to port Office 2001 to Mac OS X with much less effort. However, it still had to revise the look of the entire suite to match the new Aqua interface. In doing so, Office for Mac delivered features absent from the Windows version, such as fancy translucent charts in Excel (below). Microsoft reportedly sold far fewer copies of Office v.X than it anticipated: it shipped about half of the projected 700,000 copies in the first year. This was likely related to the sheer number of Mac users who had already paid for a $500 copy of Office the year prior. The company now wanted another $300 upgrade for v.X just to run it natively on the new OS, which itself had limited adoption prior to the release of Mac OS X 10.2 Jaguar in 2002. This prompted Microsoft to release a variety of Office packages at different price points. A Professional Edition bundled in the Virtual PC Windows emulator that Microsoft had acquired from Connectix in 2003. The company used this as an excuse not to port Access, Visio, and Project, as MacUser noted in its Review. Microsoft also added the free Remote Desktop Connection client as a reason to pay the $500 price. A Standard Edition was offered for $400, and an Student and Teacher version was offered for $150. As for policing the education version, the then general manager of the MacBU Roz Ho stated only that Microsoft had an end-user license agreement it believed its customers would honor. Two and a half years after the release of Office v.X, Microsoft released Office 2004 (Office 11) in May 2004, again just six months behind the release of Office 2003 for Windows. good enough that you dont need the upgrade. In that respect, Microsofts chief competitor may be itself." Among the new features were voice recording (below) and a Project Center that linked together related contacts, documents, and events in a single dashboard interface. 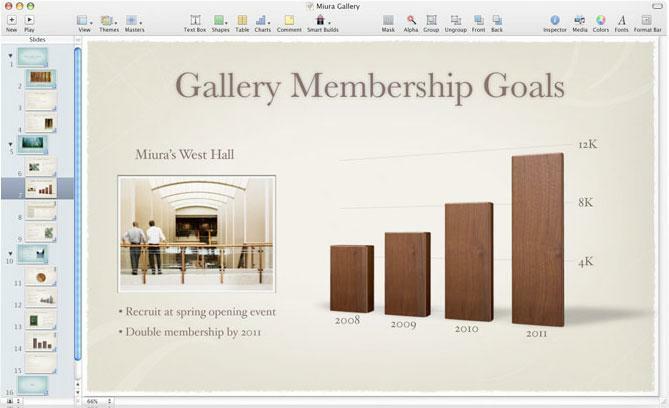 A year prior to the release of Office for Mac 2004, Apple released Keynote as a $99 new presentation alternative to PowerPoint. A year afterward, it released Pages as a similarly designed page layout program, packaged with Keynote for $79. The next year, the same team at Apple released iWeb, which was bundled with iLife, along with a revised iWork 06 package. 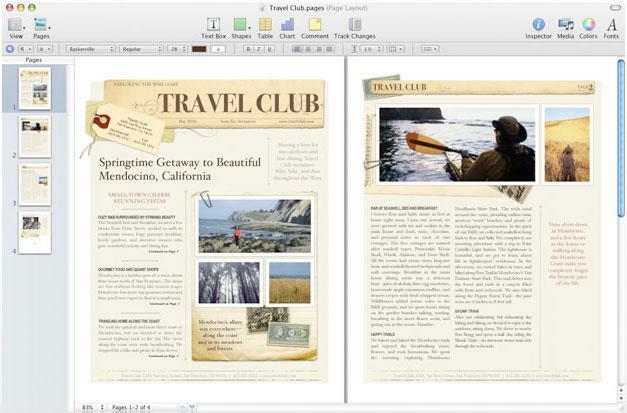 This year, Apple released iWork 08, which bundles in Numbers (above) as spreadsheet, presents new animation and narration tools in Keynote (below top) and adds word processing features to Pages (below bottom). 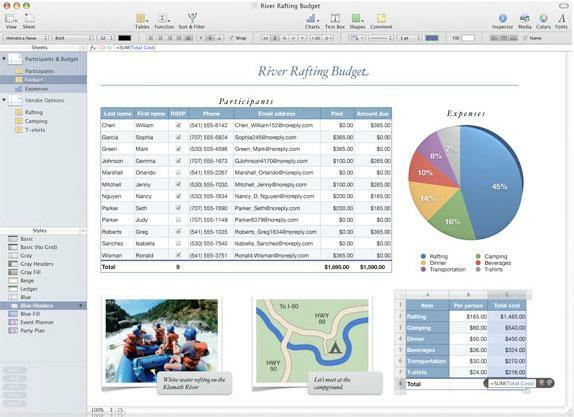 The iWork 08 package now delivers direct competition with Office for $79, and takes advantage of Mac OS X features, such as integration with iLife and standard toolbars and interface elements shared with other Mac applications. On page 4 of 4: Office for Mac 2008; What's New in Office 2008; A Mixed Bag; and A More Sophisticated Palette.